As departure day came near I worked to build my confidence — in my mind I would jump on board, throw off the shore lines and sail out of sight of land. But I mustn't have talked my inner self into it — as the days went by I found myself becoming numb. I just couldn't feel anything. As my friend Mary drove me to the marina, she looked at me as if to say, "What are you feeling right now?" I tried to reassure her by telling jokes — "My inner child just ran away" — but I didn't know what I felt. I think now it was a mixture of mortal fear that I would finally sail out of sight of land, exhilaration for the same reason, and a sense that I would suffer complete humiliation if I couldn't sail off as planned. I almost crashed my boat by pushing the throttle the wrong way as I tried to back away from the dock, a mistake I corrected before driving the boat up on shore. I think that might have been a clue to my state of mind. My friends have been so nice lately, my town brighter, more inviting than usual. But I managed to pull away from the space between the boats, built some speed and took the tiller in hand. Did you know you can't steer a boat that isn't moving? Just like a life. Then I glided past the end of the dock, leaned out and kissed Mary as I went past. It was an act of sheer arrogance, leaning away from a heavy, moving boat to kiss someone. But I was showing off for myself — I needed to know I could control my boat. The only bit of land between Brookings and Hawaii is the Point St. George lighthouse, 14 miles from Brookings — after that, 2300 miles of open water. The wind was so light and variable that I took five hours making my way to the lighthouse. I could have used the engine but I was feeling pure — it would have seemed craven to motor the first day. Past the lighthouse the wind shifted to Northwest, my sails filled and I was able to take off. Later in the day I found myself gazing back toward land, first looking at the lighthouse and coast, then in the evening I picked out shore lights with the binoculars and tried to make out what they were. By dark I was in the shipping lanes about 30 miles off the coast. I had to dodge several freighters — one got so close I could hear his engines and smell his exhaust. After dinner I scanned the ships and clouds with my binoculars. Watching the big vessels in the moonlight was my first chance to relax and feel confident about being on the sea. The next day I checked my position and found I had made 103 miles in the first 24 hours. That's a respectable distance for a small sailboat that isn't racing. Later on Day Two the wind picked up to 20 knots, gusts of 30. I double-reefed the main and rolled up most of the jib. Today the gale got stronger (30 knots with gusts of 40) so I crawled forward and pulled the mainsail down completely. I rode out the wind with just a small bit of jib unfurled. I needed to charge my batteries, but the wind was too strong for the wind generator, and I didn't want to put out the solar panels for fear that a wave would knock them off the boat, so I charged them with the engine. Several waves broke across the boat during the day. Now the wind seems to be moderating. I have put the mainsail back up and started the wind generator. The weather advisory charts say this area is always rough, no matter the season. I'm able to write today because the wind has slacked off to below 25 knots for the first time in two days, and the sun has made an appearance. Yesterday the wind blew steadily at 30 knots from the Southwest, a hard wind to sail against, and waves broke over the boat regularly. It's quite an experience when a wave hits the boat — usually it's because the boat happens to be where a wave is breaking on the open sea, a "whitecap." It sounds as if someone hit the hull with a wrecking ball, followed by water, water everywhere. The cabin is a salt water rainstorm — I think the overhead skylight lets in more water than light, and some of the closed portholes squirt water inside when a wave hits them. I wanted to print a weather chart from the radio, but just then a wave came along, the printer took a splash of salt water and died. Now I have no way to make weather charts. For the first couple of days I was in a state of physical ruin. I was cold and wet, all my spare clothing was wet, and the inside of my sleeping bag was wet. 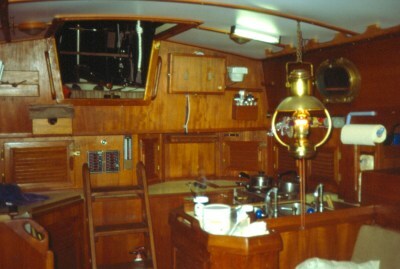 Apart from the dripping skylight, the worst part was lying in my bunk at night listening to my boat creaking and groaning, thinking it might break. Then I began to come down with something respiratory, so I started taking vitamins and extra vitamin C. Gradually I'm getting used to the conditions, also I'm so tired I've stopped listening to boat noises with quite so much attention. I have many electric toys on this boat. I want to sleep without crashing into a freighter, so I run my radar all night. If a ship comes near, the radar beeps me. I have some navigation receivers that tell me where I am. I have a ham radio setup that I use to talk to my house. And I keep a light burning on my mast all night. All these things take electricity, which comes from batteries. Every day I have to figure out a way to put as much electricity in my batteries as I take out. I can use a windmill that makes electricity when the wind blows — unless the wind is too strong, then it breaks. I can put my solar panels out — if the sun is shining and waves aren't splashing my boat's topsides. Or in desperation I can start the engine and it will charge them. My loran navigation receiver stopped working this morning. The loran system relies on shore stations and has a range of about 500 miles. I have started using my other navigation receiver, called "satnav" (satellite navigation), but I am going to try the loran again from time to time (it's useful to have two ways to know where you are, especially if they agree with each other). The wind is blowing abeam at about 15 - 20 knots right now. I put up the staysail (the small third sail) for the first time on this crossing. This sail seems to have balanced things so the wind vane keeps a steady course. The wind vane is a mechanical gadget that uses wind power to steer the boat — mine isn't very good, it only works when the wind is strong. I have made more than 100 miles each day so far, in spite of the conditions. But I didn't expect the wind to blow this hard, or from this direction — I expected to be running downwind before force 4 (11-16 knot) winds in a wing-and-wing configuration (a sail out on each side). But that may happen as I get farther away from the mainland and into the trade winds. I'm still only 280 miles from San Francisco. On day three I went out and raised my flag for the first time. I didn't particularly want to go for a walk on deck in gale conditions for such a seemingly unimportant job, but I was in international waters with no flag showing. This morning I noticed the wind has shredded it. I plan to sail from Brookings to a point in the middle of the ocean at 25 N, 135 W, then continue to Hilo on the Big Island of Hawaii. This should keep me away from the Pacific High and is only a little longer than a straight line. The "Pacific High" is an area of high pressure in the Eastern Pacific between the West Coast and Hawaii. Wind circulates clockwise around the high, so one sails South of the high going to Hawaii and North of it coming back. There's no wind at all in the center of the high, so straight-line sailing is out. But, just to make things interesting, sometimes the high moves out of its normal position. The weather is gradually improving, but the winds aren't. They had been steady abeam at about 8 knots, but now they're blowing directly from where I want to go. So I'm sailing Southeastward, to move away from the area of the Pacific High. I was able to fix my weather chart printer — I realized if I took the unit apart and sprayed the circuit boards with alcohol (which I normally use to start my kerosene stove), it might wash away the salt water. It worked. So I am making weather charts and can see what's going on — a storm headed for the Oregon coast has pushed the Pacific High down this way. I am practically in the middle of it. I hope it moves back to its old neighborhood soon. Now I know why they call this "blue water sailing." The water is as blue as I've ever seen, like the water at Crater Lake in Oregon. It's hard to believe the deep blue color, especially the side of the boat away from the sun at midday. I was able to have a conversation with Mary by way of the ham radio message system. Its signals are coming in well now. It will be interesting to see whether they hold up all the way to Hawaii. The relatively calm weather made me overconfident — I filled one of my wine glasses for dinner, put it down and looked away for a moment. A tiny wave came along and upset it. It fell off the table and broke — glass and wine everywhere. The sea punishes arrogance so quickly. The radar is proving itself on this crossing. On a couple of occasions a ship came within a mile of me, and the radar alarm woke me up to deal with it. I probably wouldn't sleep very well without it. The Pacific High has come to where I am, so the wind is light and my mileages are going down — but the weather is pleasant. I'm waiting for the classical trade winds to begin. Today is the third day with contrary winds, although in trade it's sunny and clear. The wind is blowing almost directly from where I want to go, so I have to tack to sail as close as I can to the direction I want to go. The trick is to see which tack, port or starboard, takes me where I want to go most efficiently. When the boat doesn't point directly where I want to go, only some of the boat's speed takes me toward Hawaii, but more than I would have thought at first. I punched some calculator buttons and discovered if I point the boat 45 degrees away from Hawaii, I still get there with more than 2/3 of the boat's forward speed. I didn't believe this result at first and checked it again, but it's true. And when I am 30 degrees off course, my boat still sails toward Hawaii with 86 percent efficiency. When I discovered this I realized there's no reason to struggle to point exactly toward Hawaii, it just wastes my energy and the boat's. I changed tacks this morning — I decided I had gone Southeast far enough. If the Pacific High ever goes back to its normal position for the month of May, I'll be ready. I think tomorrow I'll stop doing math and try doing my laundry. Supposedly you can wash clothes in cold salt water if you use dish soap. I've heard you have to rinse in fresh water, though. I have to decide whether to do the laundry, or just store it and use the fresh water to wash myself. That might be a tough choice. The wind started getting stronger, particularly after midnight last night. I was up even more than usual, steering away from a freighter, changing sails, tacking to see which tack was best, and generally not sleeping. The seas are very steep and short, and the wind has held all day at 18-22 knots, unfortunately directly from where I want to go. It's uncomfortable trying to make any headway against these seas. A low pressure system has stalled off the California Coast, and until it moves I will be running against strong headwinds and seas. The wind is blowing opposite the normal direction for May. I tried to wash myself with salt water, which I heated on the stove (with a special kettle I use only for salt water) and added that to a bucket of sea water to get the right temperature. It wasn't as bad as I expected. Of course, I won't know whether it really has worked until I try to sweat and can't because of all the salt in my pores. I realized I haven't had a complete night's sleep since setting out. My personal indicator for enough sleep is vivid dreams before waking. It's supposed to be very unhealthy to miss out on REM (rapid eye movement) sleep, the sleep accompanied by dreams. Maybe the wind will back off tonight and I won't have to adjust sails or dodge freighters. The daily weather report said the low pressure system to my Northwest was "weakening." That may be true, but it's also moving in my direction. I sail differently at night. I slow down so as not to be thrown around so much, even though it makes the passage longer. 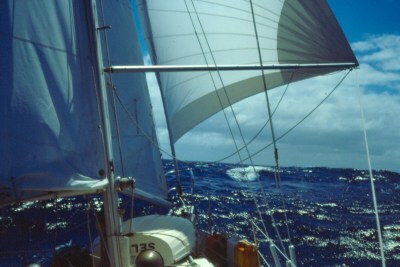 In daylight I have more energy to cope with the rough motions of a fast sail. But last night a sudden increase in wind after midnight wiped out my careful planning, so I had to get up, get dressed, and change sails. The wind increase also threw off my power generating plans — it got too strong to use the wind generator. I had watched a movie (I have a tiny TV and some videotapes), thinking I could use the windmill to recharge later. I had to use my high-power deck lights to change sails, so I ended up running down both batteries almost completely by this morning. The wind is starting to get to me — it's been blowing this way for three days now, with short, choppy seas. If I decided to take a break and heave to for a while, I'd end up going backwards — drifting with the wind and the ocean current the wind makes. I am ready for any change for the better — a change in the wind's direction, a lull in the wind for the sake of sleep, anything (except another gale). Although the low to my Northwest is weakening, it's been moving toward me over the last three days. As a result, tight pinch day 4 is starting out with 25 knot winds. I've stopped the wind generator to save it from itself, even though I could use the power. The solar panels are working, so the batteries will still get charged, although more slowly. I am making about three knots, well heeled over and close to the wind. Last night I realized I was going to have to get some deep, uninterrupted sleep. 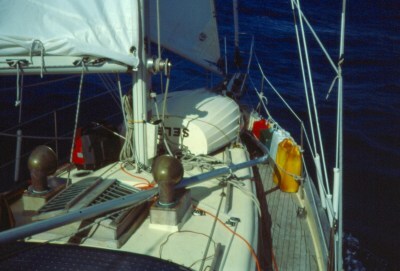 So I reduced sail, brought the speed down to about two knots to make the ride more comfortable, tied down all the noisy gadgets and slept. With these heavy seas, a small change in speed makes a big difference in comfort — I got some good sleep. I can't believe this low has remained stationary so long. If only the high will do as well when it comes back. Today I got my wish — the low pressure system finally made its move. The day started in the normal way, wind too strong and from the wrong direction. The seas kept getting rougher and the wind stronger. I saw a wall of clouds approach from the West. Then, about 3 PM, the big show began. The seas became high and completely confused, with big waves from all points of the compass. The cloud wall passed over and rain began. As the wall came up the wind gradually weakened and turned clockwise, then dropped away almost completely, but the seas stayed high. And it turned out the cloud wall had a well-defined back as well as a front — behind the wall, a warm wind was blowing at about 12 knots from the West, where before it had been a colder 30 knots from Southwest. About 6 PM the sea calmed and the clouds moved off to the East. As the sun set I adjusted my sails, and I thought how much like a conversation it had been — I couldn't shake the feeling the sea and sky were talking to me. I don't mean I heard the theme from the Twilight Zone, but everything was there for me — all I had to do was pay attention. I realized I knew exactly what the wall meant — it might as well have been words. And when I pulled my lines and moved my sails, I answered. Another high has settled in, and I'm so close to its center that I don't have any wind to speak of — just a slight variable Northwesterly. I have stopped using the wind vane (there being no wind to vane it) and now the electronic auto pilot is having trouble holding course because the boat is moving so slowly. Occasionally the auto pilot beeps me, thinking it can't possibly be attached to the boat any more. Then a breath of wind comes along and makes it happy. It's cloudy, with moments of sunlight. The sea is grayish blue and almost flat. It's so quiet that sailing seems almost make-believe. If you tug a line or push the tiller, it doesn't have the usual effect, so you begin to feel as though you aren't really sailing, but rehearsing it all in a dream. During the night I got up to check the sails, and afterward I sat watching green phosphorescent particles coming off the hull. Then I realized I had company — dolphins were surfacing and diving all around the boat. I couldn't see them clearly, mostly I heard them calling and saw their splashes. I'm having some interesting dreams. I'll dream I'm on a lake, with land all around, and if I don't watch out I'll run my boat aground. I wake up so often at night that these dreams stay in my waking thoughts. Then, after doing whatever task got me up, I sit in the cockpit and let it come to me where I am — far, far from any shore. But in my dreams I surround myself with land. Last night I was on Lake Victoria in Africa — I was about to run the boat onto a beach and say "Dr. Livingston, I presume?" Sometimes I see a long-winged bird that soars just over the waves, hunting for fish. I have some bird books and have eliminated Magnificent Frigatebird and a few others. I still haven't decided what it is. I see fewer as I move away from land, but I see at least one a day. It is brown with a light-colored bill, has long wings with a curve in them, a very efficient glider. Maybe the descriptions in my books are leading me astray — they describe most of the likely ocean birds simply as "black." I haven't seen any other vessels in three days — I'm tempted to shut down the radar at night to save power. But if the wind picks up and the sun comes out there will be more electricity than I can use. I have some entertaining ways to use power on this boat. Apart from the indulgence of movies, I listen to short-wave radio, mostly the B.B.C. (the British Broadcasting Company), and some AM radio stations from the West Coast. I have 5 multiband radios, tucked away here and there. Some have special purposes, like the ham radio, or the direction-finder set. Others I just brought along to have "a backup radio." The most-used radio is one I bought at Radio Shack — it gets the most use because it is very easy on electricity. If I didn't care about power I would use the ham radio receiver, because it is easiest to use, and it has the boat's biggest antenna all to itself. You want to have at least one good radio on a boat. It should receive short-wave, and it should run on its own batteries if need be. Here's why: (1) You can receive time signals to adjust your clocks, so your sextant positions are accurate. (2) As you get close to your destination, you can use it for radio direction-finding. (3) It's nice to hear a human voice once in a while. Things are very slow right now, because there's (again) a low off the coast of Oregon that's pushing the Pacific High right over me. I've been printing the weather charts and watching the barometer. I am only a couple of millibars from the center of this high. Until the low near Oregon moves, the high is likely to stay in the wrong place. But I am still making 2-3 knots in these light winds. At night I reduce sail even though it slows me down, because a big cloudburst might come along while I sleep and rip my fully extended sails. I plan to continue toward my waypoint, then as the winds pick up I'll turn toward the islands. Well, the wind finally came back — directly from my destination. I tacked back and forth all afternoon, doing some interesting wind calculations, but not making much progress. Then I chose the right tack for overnight — my guess was the wind would veer to the Northwest. That turned out to be right. Now I am on a close reach at 3.5 knots — but directly toward my waypoint. My laptop computer (which I also use to write these notes) tells me I should make the waypoint about the 18th if I can keep up speed. It also tells me I'll get to Hilo on the Big Island June second at this speed. Most of all I'm hoping for trade winds — rumors persist that they happen out here. During the night I had vivid dreams — of cities, crime, desperate lives. I think sailing brought that out, because of the contrast between ocean and city life. It also means I'm sleeping soundly again. Today is my birthday. Not a bad location for a birthday party. No cake, though. The temperature continues to rise. I think it's going to be hot today — the sun is in a cloudless sky. I know I'll tug and pull the solar panels around the deck, keeping them from being shaded by the sails. Then I'll watch a movie, indulge myself on my birthday. I'll make it an afternoon matinee — that way the solar panels can recharge the batteries after I've run the TV and before nightfall. I think I'm about to see a change in the wind. I am close to the latitude where trade winds begin, also the high that's been hanging over me should move North soon (as a low near Oregon dissipates, making room for it), and simple probability says I ought to have some wind from behind, at least some of the time. In the afternoon the wind began to swing around behind the boat, and by sunset I was making 4 1/2 to 5 knots. If this wind stays, the second half of this journey will be a lot shorter than the first. I'm having a rougher ride with many dramatic rolls, and even in the cabin there's no doubt the boat is moving through the water. Sometime today I'll reach my halfway point — both Hilo and Brookings will be 1130 nautical miles away. Also I'll pass North of the waypoint I've been aiming for until now. Since I have enough wind I'm turning toward Hilo. Last night I decided to start the Honda generator, another way to charge my batteries. But the starting rope broke, so I tried to fix it today. Wrestling that little generator around the cockpit was really a spectacle. The boat would roll severely every 20 seconds, throwing tools and parts all over. Sleeping last night wasn't easy. I put the special retainer line in place that keeps me from falling out of the berth, but the rolling motion kept up all night. Maybe I'll get used to it. In the afternoon the wind built to about 25 - 30 knots. I was sitting, marveling at the high knot meter readings when the whisker pole broke (the whisker pole holds the jib out for downwind sailing). I spent some hours repairing it — it's working again but about three feet shorter when fully extended. It's probably just as well that it's shorter. Today the knot meter momentarily displayed a speed of 6 knots — it's been a long time since I've seen that speed. Last night I averaged 4.9 knots, and that seems to be closer to the average. I have to adjust to the new boat motion, but these are the winds I was waiting for. I notice I can go faster when the winds decrease below 25 knots, because the wave heights go down along with the wind and the boat isn't constantly banging into waves. The wind is slowly moving from about 60 degrees starboard of aft, to dead aft. I have passed the midpoint — now I am closer to Hawaii than the mainland. Almost immediately I started to imagine what it will be like in Hawaii this summer. I guess the midpoint was a psychological barrier, before which I would only think about the passage itself. Now I am free to think about Hawaii. I am thinking again that I could go faster if the wind would subside. The surface is too rough to take advantage of the wind, and slows the boat down more than the wind speeds it up. Of course I could put up every inch of sail and tie myself down somewhere as the racers do, but I want to get to Hilo with my boat in one piece. Selene went an average speed of 6.1 knots overnight. It was a rough ride, but I didn't realize it was that fast — that's half a knot under the boat's maximum design speed. The wind is decreasing but the surface isn't calming down. Today I have scattered showers and plenty of wind speed and direction changes. The rough surface makes me think there's some wind hiding out there, waiting for me to put up a ridiculous amount of sail before making a surprise visit. So I want to act cautiously until I see a day's worth of this new wind. 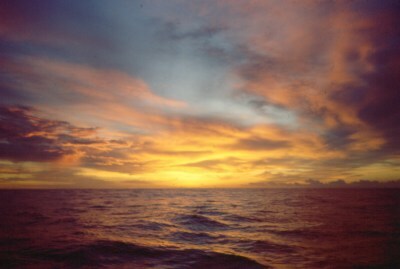 During the night the wind varied between 25 knots and nothing, and the surface stayed rough. I have decided the mystery bird (that patrols the sea just over the waves) is a "Flesh-Footed Shearwater" (puffinus carneipes). The picture in my bird book is a good likeness, and it is an open ocean bird. It's described as "sooty black" in the text but the photograph shows more of a brown coloring such as I have seen, so I think it's the best guess for now. Another bird has appeared. 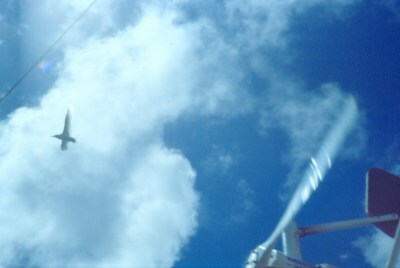 This one was easier to identify — "Red-billed Tropicbird" (phaethon aethereus). 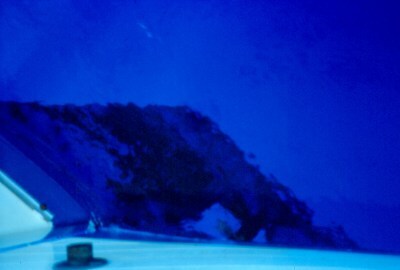 It has a long distinctive tail. Of the two I saw, one tried to land on the boat. It aimed for the windmill, but reconsidered at the last moment. The whirling blades must have caught its eye — and just as well, they would have torn it to pieces. A pretty visitor, more than 900 miles from land. The day began with scattered rain showers, but then settled down with very smooth conditions and winds in the 10 - 12 knot range. It was a beautiful run — I put up every inch of cloth and just sat back. The ride was smooth and stable. As soon as I saw how smooth it was going to be, I took a nap. Sometimes it's easier to sleep in the daytime and attend to the boat at night. In the afternoon, rain clouds developed again. Rain clouds have radial winds, winds moving out from the cloud in all directions. If the cloud is behind the boat (remember the wind mostly blows from behind now), the wind picks up — sometimes over 20 knots — and I have to reduce sail. If the cloud is in front, the wind decreases, sometimes to nothing. If the cloud is to the left or right, it changes the direction of the wind, sometimes radically. I have to pay close attention and use much less sail, so as not to be caught off guard. In the evening I played with radios. I put up a separate short-wave antenna for the Radio Shack receiver by hiding some wire along the edges of the cabin interior. I use the Radio Shack radio a lot because it takes less power, but until now it didn't have a proper antenna. Then I tried tuning in some AM stations. To my surprise I picked up several Hawaiian stations (I'm about 700 miles out). So I tried direction-finding on them. Radio direction-finding relies on the fact that the antenna in AM radios is very directional — if you point the long axis of the radio (and the antenna) at the station, it fades out. Of course, the station could be off either end of the radio, so there's some possibility for confusion. But I found my boat's long axis was perfectly aligned with the Hawaiian stations. So I have another way to guide my boat — with a radio. My ham radio link is working better than expected. 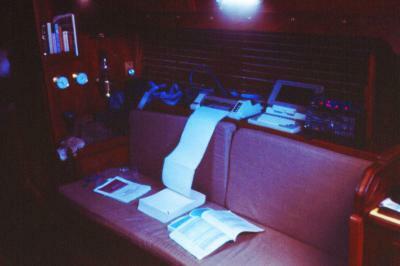 Before I started this sail, I spent some time installing and testing ham radios and computers in both the boat and my house in Oregon. I wanted to be able to write a message here, transmit it by radio, and print it on paper in Oregon. At the Oregon end, because a normal person (not a radio nerd) has to be able to use the system, there's a simple "message screen" on display. A person just sits down at the computer and types a message, then presses a key that saves it. The next time I make contact I collect the messages. I feel as though I've adjusted to being on this boat, out on the ocean. I am getting more sleep (mostly because of better sailing conditions), and I feel much better than I did at first. 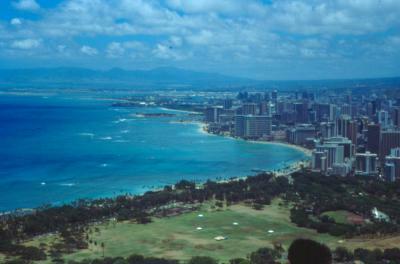 In some ways I'll be sorry when it's over, but I am looking forward to visiting Hawaii. I haven't talked much about food. As I planned this passage I packed a lot of canned goods, and then bought some fresh fruit just before departing. Granny Smith apples keep well — I could have packed more of those. I wanted some kind of cheese, so I bought a bunch of the travel kind that are dipped in wax and wrapped in red paper. They seem to hold up well. I also bought some Monterey Jack cheese that had been packed in a regional center rather than the store itself. These packages, which you can identify by their fancy plastic wrapping sealed by automatic equipment, keep well, but not as long as the wax-enclosed kind. I bought four blocks of Monterey Jack, and by the time I got to the fourth (about a week and a half) I had to trim off an outside layer of green. I brought along some freeze-dried dinners. They are great, although fairly expensive. Other dinner staples: cans of Boston baked beans, chicken stew, fruit cocktail for an occasional treat, applesauce, mixed vegetables. Cans of nuts for snacks while on watch. Jars of dill pickles. Crackers of various kinds. This sounds like a diet for someone who can't cook, but the idea is to have food you can eat even if the stove breaks down. Or a snack that you can eat without taking time away from an emergency. But I brought along some wine, too, in case things went better than expected. I thought it would be pleasant to have a glass of wine in the afternoon, when things had settled down. But as often as not, in the evening the wind would pick up, it would get dark, and I would have to work to bring the boat under control. The tasks of late afternoon and evening would seem all the more irritating if I also had to come back from wine bliss. So I have given up on wine for the time being — maybe it'll be more enjoyable when I'm anchored somewhere. Here's a typical day on sailing vessel Selene: Wake up about 7:30, turn off the masthead light and radar (I haven't seen another vessel in 16 days but I run the radar anyway), go on deck and check the sail trim. Watch the sea for about an hour. Go down to the galley to start making breakfast — first step, boil some water in the teakettle. I use this for cocoa and oatmeal. Turn on the satnav for the first of two daily fixes. About 10 AM, I print weather maps on the computer printer. Then I decide how to charge my batteries. If the sun is out I put the solar panels where the sun can get at them, and remind myself to move them later. If the wind is blowing more than 15 knots, I start the wind generator. But if there's isn't enough sun or wind, I charge batteries with either the Honda generator or the main engine for about an hour. Then I do this — I write a while. My notebook, by the way, is a computer, a small "laptop" machine with a cover that doubles as a display screen. By now the satnav receiver has a new fix. I enter the fix in my logbook and calculate how far I traveled since the last fix, what average speed and heading that was, and write that down also. Then I go watch the sea some more, adjust the sails, stay alert for rainstorms that might change the wind speed and direction, change tacks from time to time. Look at the sea some more. Read. Play music, usually in the form of compact disks, but I have a concert flute and a recorder (a medieval flute) and some sheet music. Mid-afternoon. If the sun is out and the wind is brisk, chances are the batteries are completely charged and can't absorb any more electrical power from the solar panels and the windmill (this doesn't happen very often). What to do with all that extra throw-away electricity? Watch a movie! Otherwise make a snack out of pickles, cheese, nuts, crackers, etc. Read. Refill the kerosene lamps. Read some more. Watch the sea go by. Evening. Turn on the masthead light. Light the kerosene lamps. Turn on the satnav. Make some dinner. Listen to the news on the B.B.C. Late Evening. Knowing I am about to run the masthead light, radar, and auto pilot all night, I decide whether the wind generator can supply the necessary power. If not, run the engine again for about an hour. Later Evening. Turn on the radar. Check heading and sail trim one more time. Get into sack and read some more. Sleep. Even later, after the tiniest bit of sleep: Get up, light a light, find my glasses, open the hatch, and discover why the sails sound as if they're being beaten up by juvenile delinquents. Repeat as necessary to guarantee no REM sleep. I wonder if I'll be as anxious about ending this voyage as I was about starting it? I remember being absolutely petrified, about to say good-bye to my friends, the shore, life as I knew it, and cast off lines for a spell that could have lasted a month or more. I didn't want Mary to leave the boat, because when she did I would have to start. No more preparations, actually leave. I remember lying in my bunk those first few nights of bad weather, listening to random creaks and groans, thinking "That's breaking. It's breaking. I'll die out here and my friends will tell unkind stories." Now I feel as if the shore life is the fragile construction, more likely than this boat to have been assembled by incompetents. I'm starting to like this life. The return to shore will be another difficult adjustment. Now I think I can explain being out in a little boat on a big ocean. Well, I can try. At about the halfway point, over a thousand miles from San Francisco and an equal distance from Hawaii, I was watching the afternoon sun move behind some clouds. Sunbeams were making their way through holes in the clouds, making islands of light on the water. I thought to myself how this would make a good picture for a fundamentalist, who would argue that God was up there, pulling puppet strings of light. Then I thought to myself — as I tend to when faced with a ridiculous example of natural beauty — okay, again you've decided how not to think about this, but don't go too far. Don't be so careful and skeptical that you leave yourself with no sense of wonder at all. You can enjoy this without falling into superstition, you know. It's been done. So I stopped thinking about what it didn't mean, and just watched the show. Then it came to me that I might be the only person seeing it — I don't mean in the sense of a rainbow, everybody having a slightly different angle of view — but nobody within, say, 500 miles of the place. I realized this cloud bank, this scene, was mine — I was the only witness. I wouldn't be able to ring up a friend later and say "Did you see the nice sunset?" This orange mixture of sunlight and clouds was not part of normal human experience — it didn't pass through panes of tinted glass, or throw shadows across floors. No apple vendors or tax accountants would look up and see it — just this one guy, on a boat. Watching a sunset that only I could see gave me a peculiar sense of responsibility. If I didn't see it and enjoy it, no one would. Only the dolphins and the birds. The wind has slacked off a lot, and my speed is going down. Surprisingly, the wind now picks up during the night. I have gotten accustomed to letting the full mainsail fly during the day, and setting one reef (reducing size) in the last of daylight. The weather chart says it all. Now there are two highs, one to the Northwest, one to the Northeast. I am between their wind patterns, but not getting the advantage of either. Right now there's not enough wind to keep the Genoa properly inflated. Nevertheless, I'm doing four knots — almost twice as fast as during the headwind phase of this voyage. There were two more flying fish on deck this morning. They're getting bigger. I wish I could hear them flapping their wings or something so I could save them, throw them back into the sea. I have started cleaning up the boat in preparation for arrival. The galley was very grungy, so I started there. Imagine the humiliation of having a customs inspector come on your boat and kill himself on a banana peel. Today is sunny and very pretty, and the wind is mild. I could have slept until noon. Days like these discourage me from wanting to get anywhere. Maybe sailing is one of those ready-made roles-in-miniature, giving you a feeling of clear, simple purpose in an otherwise cryptic world. Just put out sail, take in sail, look through the sextant, immerse yourself in the minutiae of going somewhere slowly and deliberately, while secretly hoping you'll never arrive. Yesterday, about 130 miles out, I tried to see the big island through binoculars. The biggest peak is very high — over 13,000 feet. I calculated the big island should be just above the horizon — but maybe I looked too soon, considering how cloudy and hazy it was. The sailing is still slow. If the wind would just pipe up I would be in Hilo before dark tonight, if not I will have to decide whether I want to enter the bay after dark. There's some moonlight right now, but there's also a reef near the entrance, and you can't see the reef at night, moonlight or not. I have been making subtle adjustments to the approach of land. I put my wallet back in my pocket. I gathered all the boat papers and put them in my day pack. I am flying the "Q" flag for customs (I haven't figured out whether I count as a foreign vessel, or just an American sailboat that happens to have crossed the ocean). I tried putting on shoes, just as an experiment. In spite of the times I was becalmed and felt as though I had to get moving again, it's ending too soon. I only read 1 1/2 books. My pickle jar is still half-full. 10 AM: The morning clouds are lifting and I can make out the Big Island, 30 miles off. This is a bittersweet moment — there's something solid in front of my boat, not just a particularly high wave. I have to stop and deal with it — I can't just sail past. I found this island, out in the ocean, mostly using satellites and radio signals, but also by looking at stars with my sextant, the old-fashioned way. I might want to say I got here against hard seas and confusion — there's some truth in that — but a greater truth is the sea was kind to me. 4 PM: I can see people in long racing canoes, paddles striking the water. I hear the sounds of the land. Maybe I don't want to sail past after all.